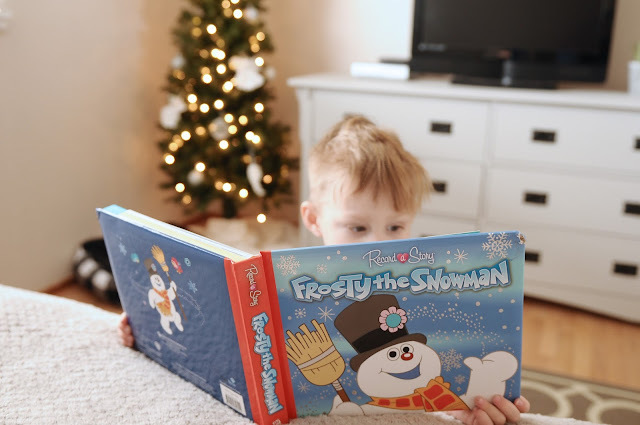 Some of the best memories are created around the Holidays and a favorite thing of mine to do is curl up with a good book and I have loved watching my son do the same thing! One thing I do not really limit is books. If he wants a book most of the time I allow it. Just because literacy is so beneficial for brain development in SO many areas! Language development, social development (by reading with others and making connections with relationships in books), and even helping with things like attention span and stress and anxiety management. 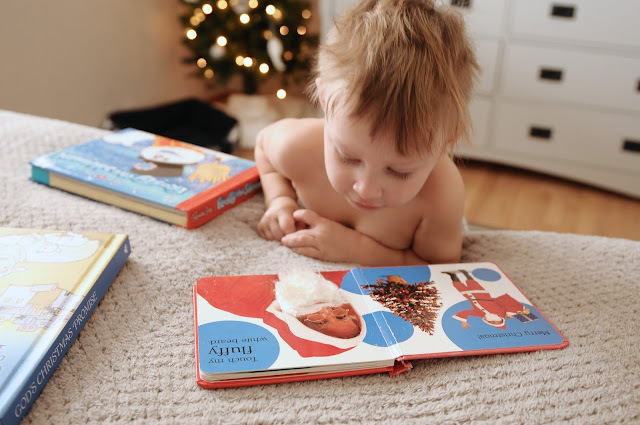 Check out this article from EarlyMoments.com for some more benefits of why we should make great habits of reading to our children! 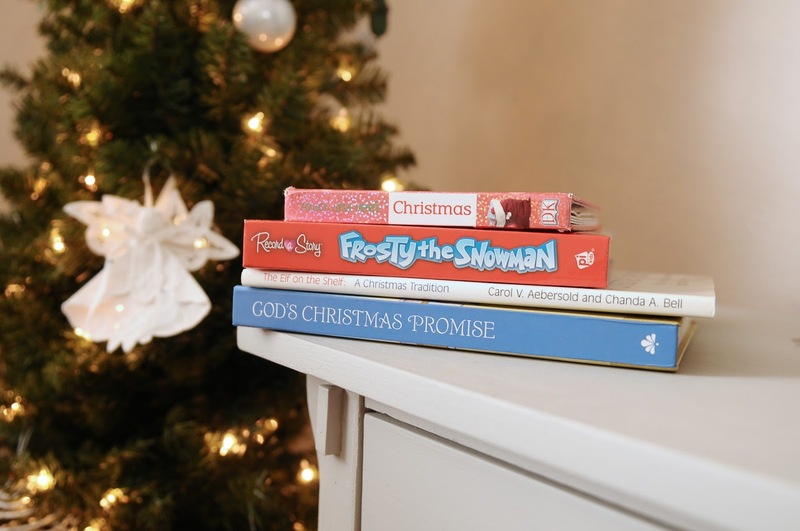 So I wanted to share some of the favorite books we have on repeat during the holiday season! Two out of the four books are recorded readers so they can actually read to him or even be stopped if I want to read to him. These are shorter stories because Maverick is only 2 1/2 so he's still working on the attention span and sitting through a really long book would be merely impossible. The first book is God's Christmas Promise. He received this book from his sweet grandma. She reads the whole Nativity story to him using the recording tool in the book. (We have it on lock, so it doesn't get recorded over) It's so special and he loves opening up the book and hearing grandmas voice. The other day we were in TJ Maxx and he saw a figurine from a Nativity Set and pointed to it saying "Jesus!" My heart just about melted. I think the figurine was actually Joseph but the long brown hair and linen clothing must have made him remember Jesus from his story. The book tells the story of of Christ Jesus' birth and why we celebrate Christmas. This is such a special book! The second book is The Elf on the Shelf. This has become a favorite as of this year. Maverick absolutely loves his "Yelf" and associates all of the "Yelfs" as "his". ( I don't think he knows they're all different elves) It adds to the magic I guess! This book tells the story of the Elves, their job and the Christmas Tradition of The Elf on the Shelf. Its a family favorite now! The third book is another record able book. Frosty the Snowman. We found this at Costco, but it's available on Amazon too. Maverick has really taken a liking to Frosty the Snowman this year. He watches the movie about 5 times a day (I am by no means kidding or over exaggerating, 5 times a day at least!) He loves the catchphrases and even marches around the house like Frosty and his friends. I love seeing him get so excited about a classic that I loved so much as a child too! So when we found this book at Costco we had to get it. It's not the full story, it actually just breaks down the Frosty the Snowman classic song throughout the book but it's still a very fun book! The fourth book is Touch and Feel Christmas. This book he got last year and really loved it. He actually took this one out all year and gets excited every time to see "Santa" in the book. He loves the sensory filled pages with many different textures. Maverick will point and say what he sees in the book. This book is a great learning tool, fun to read and is so festive for the holiday season! I hope this encourages you to take some time to slow down and enjoy some quiet time with your little ones during the Holiday season. It can get pretty crazy this time of year. What are some of your favorite books this time of year? I'd love some great ideas for next year! Thanks for stopping by!